Ever fantasized about being a ninja? Of zipping through crowds and performing amazing acrobatic feats? Then the Aerial Ninja Obstacle Course is the perfect spot for you! Experience the ultimate obstacle course and challenge yourself to become the ninja you’ve always dreamed of! Jump, climb, balance, and maneuver your way through various obstacles using your ninja skills of speed, agility, and focus. Overcome the thrilling trials and claim bragging rights at one of the most fun activities in Minneapolis! Designed to help you practice awesome ninja skills, our course can help you test and increase your agility, speed, stamina, and focus. Train your body, build strength, and hone your physical and mental abilities to easily master any ninja challenge. The obstacle course is one of our most popular activities for kids and families. Spend time with the family and attempt the ninja challenges as a team. Build trust and self-esteem, all while enjoying the ultimate family time. Jacob’s Ladder: Test your whole body on this tilted staircase and climb with both your hands and feet. 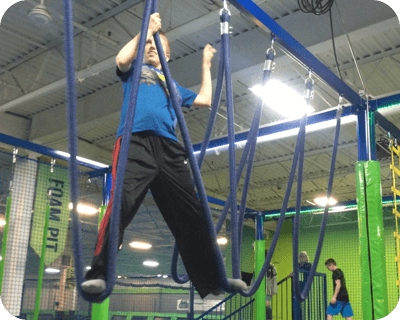 Not only does Jacob’s Ladder build strength, but it also teaches agility and maneuverability. Hanging Disks: Challenge your upper body strength, timing, and aim as you make your way across hanging disks. Zig Zag Walk: Practice your coordination as you side step across the zig-zag balance beam. Teeter Totter Walk: Calculate your moves carefully as you try to balance on a teeter-totter while using your speed and agility to quickly make your way across. Wavy Ladder: Practice your maneuverability by traversing a ladder in a wave pattern, utilizing focus, strength, and excellent hand-eye coordination to make your way across. Hanging T Bars: Balance, coordination, and agility are key to get across the Hanging T Bars. Learn to shift your body weight to gain momentum and balance as you cross. Balance Beam: A traditional exercise for gymnasts, the Balance Beam teaches agility and balance. Challenge yourself to cross the narrow passage as fast as you can! Horizontal Ladder: Train your coordination while attempting to cross the Horizontal Ladder. Cargo Net: Channel your inner spider as you traverse the netting. Use both upper and lower body strength to maneuver across. Ready to test your skills on the Aerial Ninja Obstacle Course? Contact us for more information on how to book your next adventure at Zero Gravity! 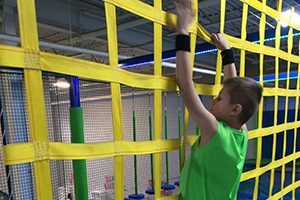 If you’re into acrobatics, parkour, climbing, or just want to test your speed, agility, and strength against your friends, the Aerial Ninja Obstacle Course is for you. Most similar courses require complicated harnesses and ropes to ensure safety, but we’ve rigged up a different system – we’ve enclosed the entire structure in double layers of safety netting. Lose your balance or grip and tumble off an obstacle and free-fall a short distance to the netting, then climb back up to take another shot at the obstacle course! If you’re a parent with kids of different ages, or supervising a playgroup of different ability levels, the Aerial Ninja Obstacle Course is an excellent alternative to some of our more technical features. 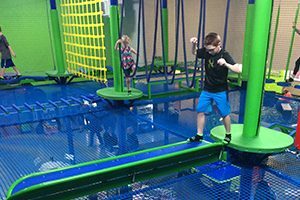 Although physically demanding, it is suitable for most ages, and even adults uncomfortable with our trampolines, foam pit, and slam dunk arena can often be coerced into maneuvering across obstacles suspended above onlookers. Are you anxious about heights? Challenge yourself in a safe and fun environment, and walk away knowing you’ve conquered your personal demons AND our course! Want to participate with your kids? This is fun for the whole family! Our net course is the spot where camp counselors, teachers, babysitters and athletes all come together to swing, balance, leap and maneuver across a landscape of professionally-engineered obstacles and features. For the littlest gymnast or ninja warrior in your crew, the net course may be the best way to show off those skills without having to compete with the big kids. Contact our friendly staff with questions about age and height restrictions or recommendations for scheduling your adventure at our state-of-the-art facility. At Zero Gravity, we want to make sure you have a birthday party, play group, or family outing to remember and that you’ll visit us again and again! We also have Party Packages to fit any size group or budget, Zero Gravity is the place to hold your next birthday party, group celebration, or team building event. Private party rooms are available for groups from 10-40 guests. Book online now or call us today!